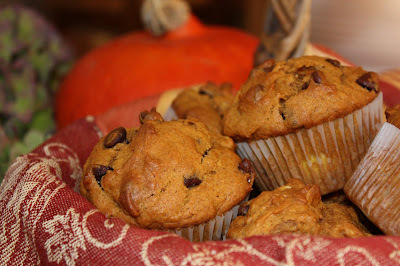 I thought these muffins would be a fun way to mark the beginning of Autumn, my favorite season of the year! There...I said it. Though at least I waited until summer was "officially" over before doing do. It's not that I don't LOVE summer. I do. It would be "anti-something" to say that I didn't. Everyone (I think?) loves summer, especially in the Pacific Northwest where we ALL wait so patiently for its warmth (and sunshine!) to arrive. Not unlike Midwesterners or East Coast folks...only we get ours without the sticky air. And, unlike some of our neighbors to the south, our hills (for the most part) remain green and lush. Summer here IS beautiful (and much appreciated) but it truly doesn't arrive in all its glory until at least July...so we are very patient. Oh yeah, we get a few great days in Spring...just enough to throw us off our mark, sending "us" racing to the garden stores to get all those gorgeous flowers. I fall for it every year, planting borders and filling pots well before Mother's Day, much to the chagrin of my more experienced gardening friends. I just can't help myself! But it's not until at least July that we can confidently string a good number of days together; our excitement for the season buoyed by the arrival of long-awaited forecasts for bright sunny days with no chance of showers. Our summers are so nice that they cast a spell on the lot of us...happily, blissfully enjoying our long, sun-drenched days without any memory of the seemingly endless cloudy and rainy days that have passed before. It's a nice spell...one I think we secretly enjoy and look forward to...a happy ignorance. So what is it about the Fall? For one, I love what happens to our landscape and skies. Clouds seem puffier, more billowy and unusually white. Our days are still filled with sunshine but there's a wonderful crispness in the air. And the sky seems to take on a bluer blue. Best of all, as the season continues, the leaves begin to change...turning from their brilliant greens to crimson, gold, pink, and chartreuse. The variety of color never ceases to amaze me. I've taken picture upon picture of the beautiful leaves, not really knowing what to do with them but determined to capture the moment...if only to delete them months later. It's really only a few weeks of unbelievable color that we experience before the leaves begin to weep from the trees and are quickly swept away by the wind, leaving bare-branched limbs to meet the graying skies alone. Before long, we have piles along our roads and on our lawns, many displaying a glorious spectrum of hues before they eventually lose all their luster. I have been known to stop and assess these fallen heaps, plucking the prettiest leaves to take home...carefully placing them on my printer/copier to transfer their colors and shapes to beautiful linen card stock to use as note cards, content in my meager efforts to extend their beauty just a bit longer. I think I welcome each season for its unique beauty but the colors and crispness of Autumn will always be my favorite. So...this little muffin seems like a fitting welcome to my favorite season. 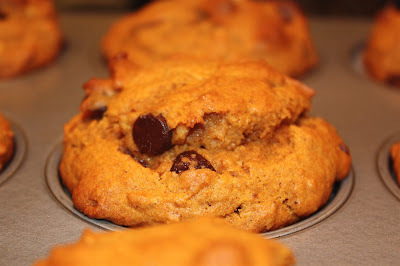 It's super easy to make and it's truly just plain yummy...moist, sweet (but mildly so), chocolaty (always good in my opinion), with a hint of that cinnamon-pumpkin flavor that evokes the season and perfumes your kitchen and home with warmth. It's so easy you don't even take out a blender...just a couple of bowls, a good whisk, and a spatula will get your batter perfectly prepped for baking. I admit I was a bit hesitant when first offered this treat by my good friend. It's HER recipe and she's a great cook and baker so I knew it had to be yummy BUT I do admit thinking: pumpkin AND chocolate, hmm? They're so tasty on their own, why mess with a good thing? 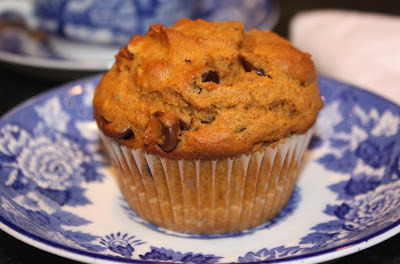 I'm also not a big fan of peanut butter and chocolate combinations (preferring them each on their own), so I kind of figured this muffin might elicit the same opinion. I was wrong. My only warning: prepare to have them devoured. They're kind of like potato chips in that you can't stop at just one (sorry...that's my best analogy as a "potato-cheese-bread girl"). Enjoy! 1. Heat oven to 350 degrees. Lightly brown almonds in oven or on stove, being carefully not to burn them. Set aside to cool. 2. Grease muffin pan or use paper liners. In a large bowl, thoroughly mix flour, sugar, spice, baking soda, baking powder, and salt. Set aside. 3. In a smaller bowl, break eggs and add pumpkin and butter. Whisk until well blended. Stir in chocolate chips and toasted almonds. Pour over dry ingredients and fold in with a rubber spatula until well blended into a moist batter. 4. Scoop batter into muffin pan/liners, filling generously without spilling over. Bake 20-25 minutes, until puffed and springy. Check muffins with a tester to ensure that batter is baked through. Place muffins on a rack to cool.